It's been a very long time between drinks for the Trappist Beer section on Beer O'Clock Australia! Tonight we are back with a beer from one of the monasteries that last time I wrote on the subject, I had hoped would have their brewery setup. Stift Engelszell is only the second Trappist brewery outside of Belgium. They've been producing beer since the middle of last year but only started exporting recently. 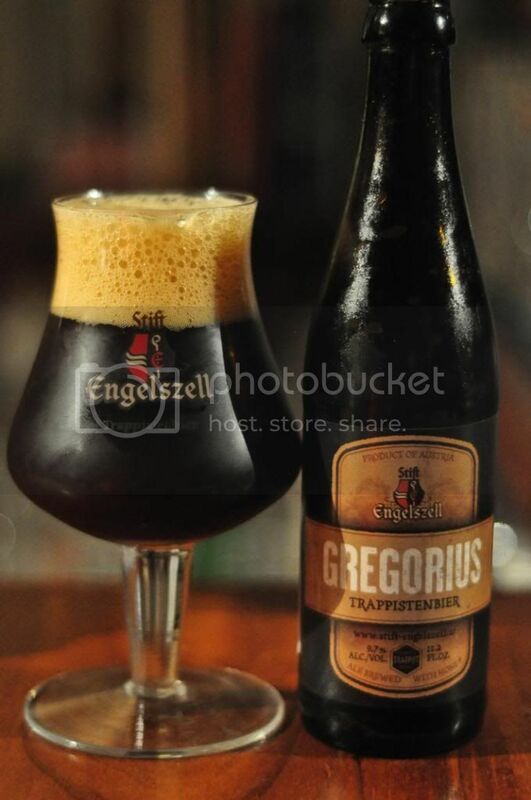 Gregorius was their founding beer; and there's a bit of debate about what style this beer is. Many people call it a quadrupel, Stift Engelszell call it a dark tripel, so I'm going to call it a Belgian Strong Dark Ale and cover all bases. The body of the beer pours a dark brown colour with a quite dark cream, almost khaki, coloured head perched atop. The head is extremely short lived with large bubbles forming almost straight after being poured, within a matter of minutes there is not even a speck of foam left on the surface of the beer. It's certainly not what you would expect from whichever style of Belgian ale this is. Stift Engelszell's Gregorius has an intriguing nose. There's plenty of dark sugar (maybe molasses), a bit of honey, some earthiness, even some cloves. As it warms there's notes of dark fruits, particularly dates and I think cherries, as well as some typically Belgian yeasts. Warm alcohol notes are a little off putting but it isn't hugely detrimental to the overall aroma. Gregorius has a less complex taste than the aroma would dictate. It's semi sweet with caramel malts, honey and the molasses flavour coming to the fore early. The flavour changes over the course of drinking and there is almost a tart cherry flavour by the end. The latent alcohol is there but isn't unpleasant by any means and it adds a warming characteristic that is quite nice. I would also add that the carbonation is almost too low, if that's possible, and make the mouthfeel a bit light. Even after tasting the beer I'm not sure what I'd classify this beer as. Certainly it's got elements of all the aforementioned styles but the mix is slightly unbalanced and the result isn't brilliant. Don't get me wrong this is a very nice beer, but I'm not sure it's quite at the level of some of the other beers produced by Trappist monasteries. I will certainly be following this brewery with interest and have got a couple of these to age and see if anything comes of it as it matures.